A book I loved this weekend full of news, referendum updates and politics. 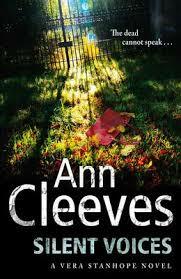 Silent Voices by Ann Cleeves. I really like Detective Inspector Vera Stanhope and I enjoyed this more than Cleeves’ Shetland series. Dysfunctional low personal self-esteem but very efficient professionally detective, interesting characters, a decent plot and a nice setting. Add a relaxing Sunday morning, a freddo cappucino, an ice-cream treat from my <3 and you get the picture. When DI Vera Stanhope finds the body of a woman in the sauna room of her local gym, she wonders briefly if, for once in her life, she’s uncovered a simple death from natural causes. But a closer inspection reveals ligature marks around the victim’s throat – death is never that simple. Doing what she does best, Vera pulls her team together and sets them interviewing staff and those connected to the victim, while she and colleague, Sergeant Joe Ashworth, work to find a motive. While Joe struggles to reconcile his home life with the demands made on him by the job, Vera revels being back in charge of an investigation again. Death has never made her feel so alive. Death and taxes and my birthday!